Veiled in a secluded valley, this National Trust property promises to surprise and captivate with its vast Cistercian abbey ruins, Georgian water garden, a medieval deer park, Elizabethan Hall and Gothic church. From humble beginnings this magnificent abbey grew to be wealthy and powerful. In Porter’s Lodge uncover the story of the devout monks who founded the abbey in search of a simpler life, hear a tale or two on a free guided tour and see the mill created by these skilful masters of machinery. Studley Royal Water Garden is an outstanding example of the ‘English’ garden style that swept across Europe during the eighteenth century, and is in fact what makes this magnificent estate a World Heritage Site. Created by father and son John and William Aislabie, the design of this garden is a pre-cursor to the later style which became synonymous with Lancelot ‘Capability’ Brown. Eye catchers and follies were a common feature within ‘English’ gardens and the Aislabies built many of these. Elegant ponds and cascades entwined with rustic bridges, classical temples and statues enthral today’s visitor just as they would the pleasure-seeking Georgians. There could be no finer eye catcher, however, than the grand ruins of Fountains Abbey. 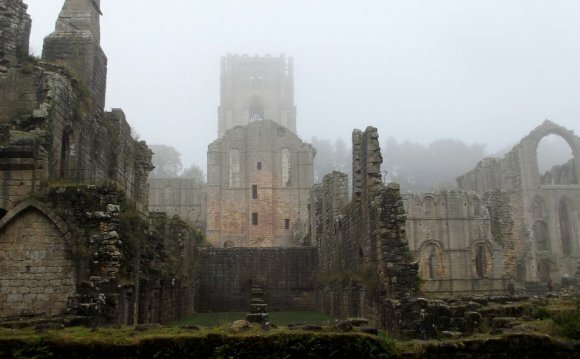 Open year-round, Fountains Abbey is fantastic for walks and each season brings its own unique delights to see. Watch wildlife awaken in the springtime, catch the colourful wildflowers during summer, enjoy autumnal splendour by floodlight and wrap up warm to see the atmospheric ruins sparkle with frost as winter returns. Fountains Abbey, On the edge of the Yorkshire Dales.